I watch a lot of Good Eats. I don’t want to say that I’ve seen every episode, but I’ve seen most of them for sure. I like the show because it is so darn cheesy; you can’t help but laugh. And Alton Brown knows everything about the science behind food. 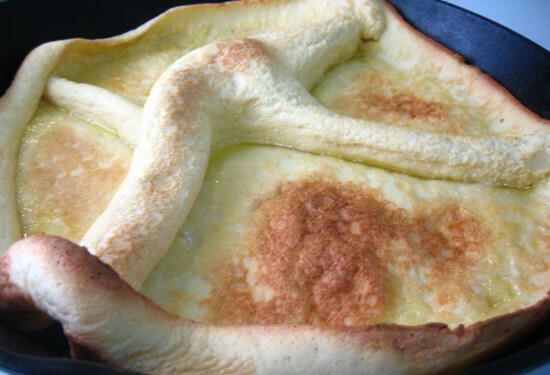 The pancake like thing is called a “dutch baby.” I have no idea why. 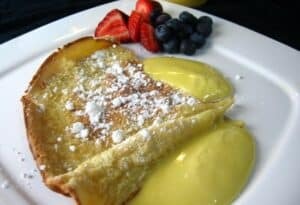 It is sort of a cross between a pancake and a crepe. Traditionally, it is served with slices of lemon, but I thought it would be a good chance to make Alton’s lemon curd and couple them together. A fresh breakfast dutch baby (baked pancake) with homemade lemon curd. 5 egg yolks. That's right you need to separate them. 1) Get a medium pan, fill it water and put it on to boil to make a quick double boiler. 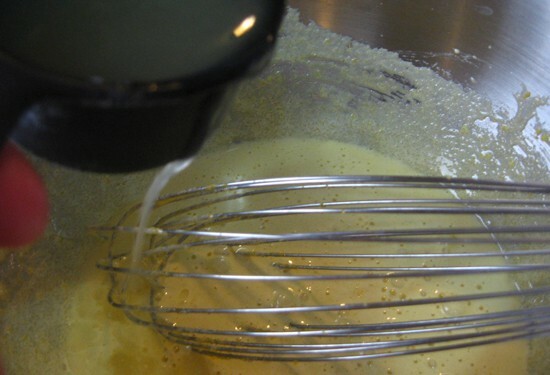 Whisk together sugar and egg yolks in a medium bowl until smooth. 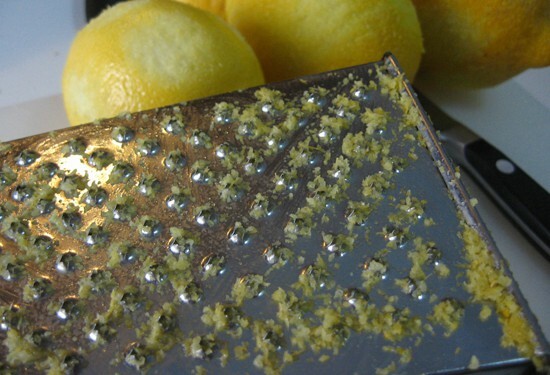 2) Add in lemon zest and 1/3 cup lemon juice. 3) Put your mixing bowl (hopefully metal) right on top of the bowling water and whisk constantly. 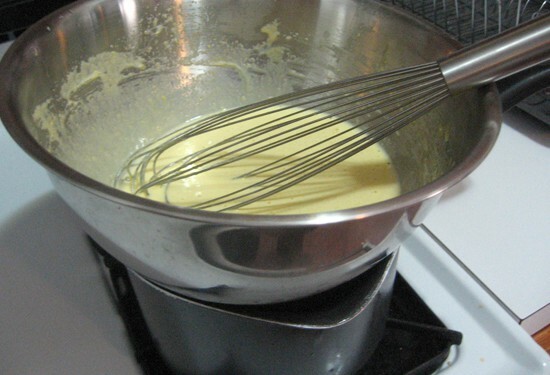 4) Continue to whisk and heat for about 8 minutes until the mixture starts to thicken and bubble. Ultimately, it should coat the back of a spoon and not run immediately if you draw a line through it. Once it has thickened a bit take it off the heat. 5) Chop up your butter into even cubes. You want 10-12 cubes total. 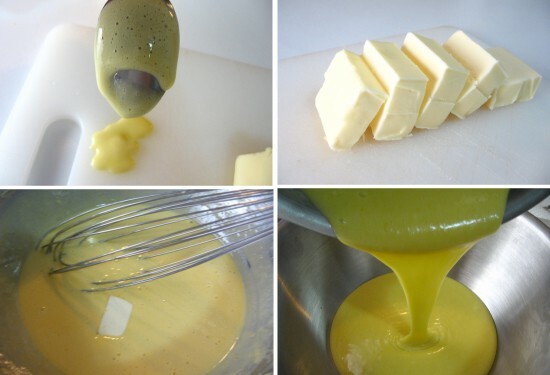 Whisk in the cold butter one cube at a time into your hot yolk mixture. This slowly cools down the yolk mixture and incorporates the butter smoothly. 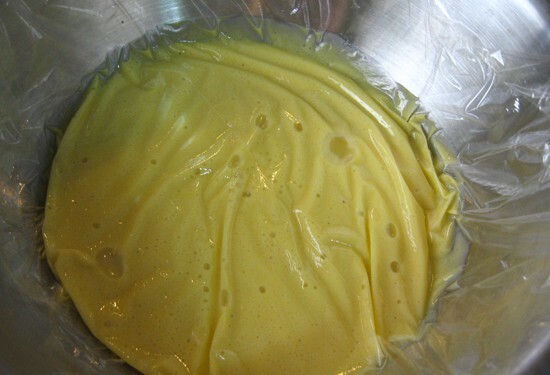 6) Cover the curd with plastic wrap (on the surface) and refrigerate for a few hours. You can make it the night before for best results. 1) Preheat oven to 375 degrees and place two tablespoons butter in cast iron skillet. Place skillet in oven to heat for at least 10 minutes. 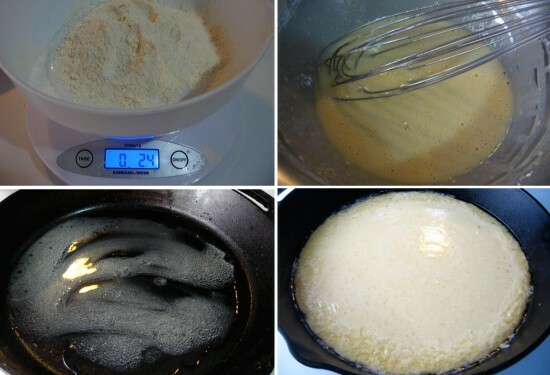 2) Combine your milk, eggs, sugar, salt, vanilla, and tablespoon of melted butter in a bowl. Slowly whisk it in until you have a smooth batter. Then quickly pour the batter in your very hot pan and stick it back in the oven. 3) Bake until the pancake puffs up and is golden brown, about 30 minutes. 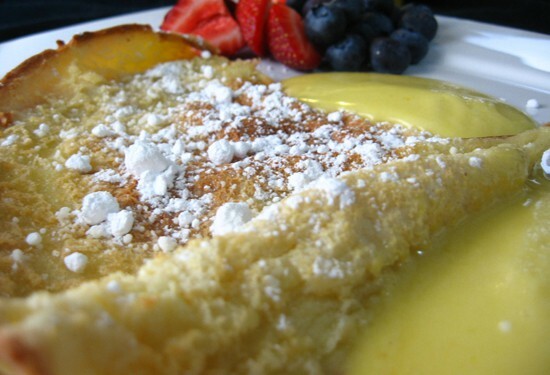 Slice and serve with powdered sugar and lemon curd. If there is one thing that I learned from this dish it is that homemade, fresh lemon curd is AWESOME. It’s tangy and sweet and much better than the gelatin-like stuff in the jar. Simple stuff for big flavor. The curd is pretty easy to get started. First, get a medium pan, fill it water and put it on to boil. This is going to be your double boiler when you need it. 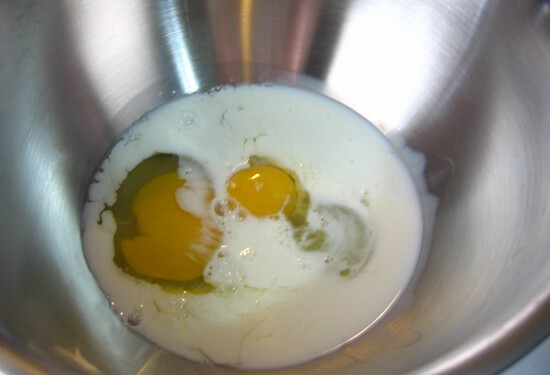 Then mix in your sugar and egg yolks and whisk them for a few minutes until they are smooth. Then it’s time to add your flavor. 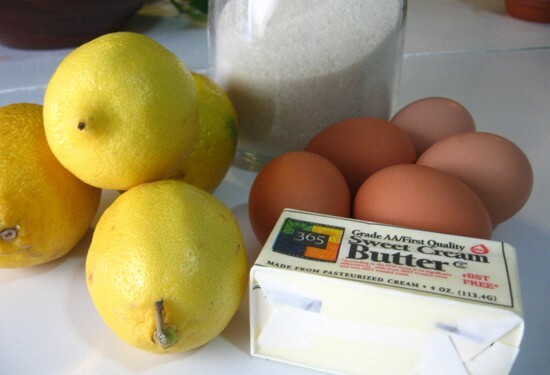 Zest your lemons and add all the zest to your yolk mixture. Try to avoid the white pith part. If you have a microplane then this will be easy. I used the back side of my box greater with fair success. Then add 1/3 cup of lemon juice. You could add more if you want it tangier. This was the perfect amount for me. Add lemon juice and whisk it up. Now for the setup. Put your mixing bowl (hopefully metal) right on top of the bowling water and whisk like a mad person. Will your arm get tired? Yes. Is it worth it? Definitely. I’m exaggerating a bit though. You don’t have to whisk it like you are beating eggs whites, just keep it moving. You will need to do this for 8 to 10 minutes until the mixture starts to thicken and bubble. Ultimately, it should coat the back of a spoon and not run immediately if you draw a line through it. Once it has thickened a bit take it off the heat. Now you must work fast! Chop up your butter into even cubes. You want 10-12 cubes total. Whisk in the cold butter one cube at a time into your hot yolk mixture. This slowly cools down the yolk mixture and incorporates the butter smoothly. If you did it all at once you would have globs of butter. By the time all of your butter cubes are melted, the curd will be at about room temperature. Then you want to cover with plastic wrap and refrigerate. Actually lay the plastic wrap on the top of the curd which will prevent a film from forming in the fridge. I made the lemon curd the night before, but you should let firm up in the fridge for a few hours at the minimum. Start out by placing a sturdy skillet, preferably cast iron, in a 375 degree oven, with 2 Tablespoons of melted butter in the pan. Get this sucker hot. At least 10 minutes in the oven will be good for it. While that is happening combine your milk, eggs, sugar, salt, vanilla, and final Tablespoon of melted butter in a bowl. If possible, weigh out your flour. If you don’t have a scale then approximate it at 1/2 cup. Slowly whisk it in until you have a smooth batter. Then quickly pour the batter in your very hot pan and stick it back in the oven. This batter will bubble up cook into a golden brown disk thing. Looks kind of weird, but it is really tasty. It was even puffier. Just couldn’t take the photo that fast. Cut a big slice for yourself and/or your lover, sprinkle generously with powdered sugar, and serve with big dollops of that homemade lemon curd. A good mix between a pancake and a crepe. If you try this and realize how delicious it is, don’t thank me. Thank Alton. I’m just the messenger. I luv Alton Brown. Have you tried his french toast? One word. Rad. Whoops? You didn't include the cook time. Glad you linked AB's recipe. Love the blog!